Frank Leslie's Illustrated Newspaper, March 7, 1891. Two days later, on the evening of December 16th, the temperature was falling rapidly and high winds blew across downtown Manhattan. At about 9 P.M. night watchman William Hayes was patrolling the financial district when he began to smell smoke. As he came to the intersection of Exchange and Pearl Streets, he discovered the source of the smoke: a large warehouse, located dangerously close to some of New York City's most prominent commercial buildings, was engulfed in flames. Other nearby patrolmen quickly joined Hayes; within minutes Engine Company 1 had also arrived. The fire was still contained in the warehouse, but this did not last long. Within twenty minutes fifty buildings had caught on fire thanks to brutal, winter winds. The city's aldermen rushed to the financial district as they always did in a fire. The bell towers summoned exhausted, worn out fire fighters still recovering from suppressing a large fire a few days earlier. According to a New York Herald reporter, by 10PM, about forty of the city's richest dry goods stores were destroyed. The Herald reporter was already estimating damages in the city in the millions. It had been only one hour since the fire was first discovered and the race to stop it had only just begun. As formidable an enemy as the fire was, so, too, was the deep winter weather. The winds not only stoked the flames, but also prevented the firemen from combating the flames. The temperature had dipped to below zero and fire hydrants froze. The high winds also blew the water away from the fire and into the faces of the firemen. The popular Fire Chief James Gulick sent numerous engine companies to the East River for water but the river was covered with thick ice. The firemen wre forced to cut holes in the river ice to extract water. Once they secured water, it was of little use as it quickly froze in the hoses. 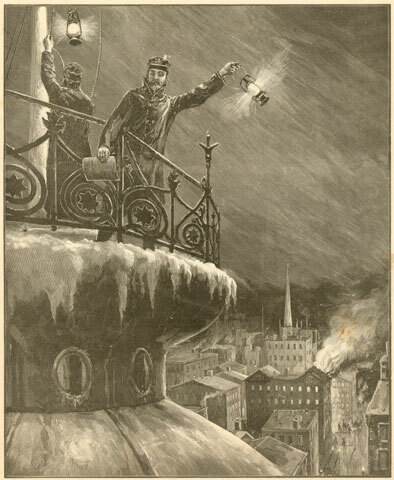 The firemen resorted to pouring brandy on the engines and into their boots to melt the ice that was everywhere. The fire raged on. Merchants, desperately trying to slavage their stock, tossed goods out of buildings onto the streets below. Papers swirled in the wind and landed all over the city and even as far away as New Jersey. Embers spread from the fire to Brooklyn and set a few rooftops on fire there.